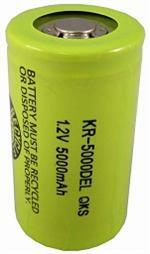 Home > Battery Cells > HR-DU : 1.2v 10,000mAh rechargeable NiMH D size battery - SALE ! HR-DU : 1.2 volt 10,000mAh rechargeable "D" size Ni-MH battery cell. Sanyo brand product; highest quality, highest true capacity (10,000mAh) D-size cell. Flat-top design. Solder Tabs are available (one on top & one on bottom) - spot-welded on battery for $0.25 extra per cell.